The family-run 3-star Hotel Souvenir is just a few minutes from the sea and offers parking, free Wi-Fi, air conditioning, a swimming pool at the beach and a certified kitchen for vegans. Admits animals of small and medium size. 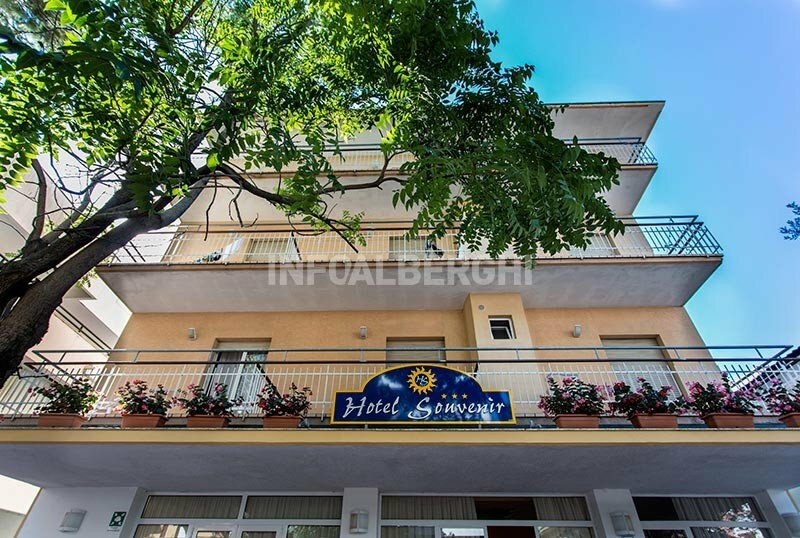 The hotel is located in Misano Adriatico, a seaside resort located between Cattolica and Riccione, in a central and pedestrian area, just a couple of minutes walk from the beach. The area is well served by public transport, with which you can reach the Marco Simoncelli Misano World Circuit in about 20 minutes. All rooms have a balcony, air conditioning, free WI-FI, satellite TV and digital terrestrial, safe, telephone and new bathrooms with hairdryer and shower. The minibar is available on request and cleaning takes place every day. Open-air porch equipped with chairs and tables, free use of bicycles and elevator. The staff organizes theme nights. CONVENTIONS : beach and amusement parks. Shuttle service and excursions on request. SERVICES FOR DISABLED : the hotel has an entrance located on the ground floor and access to the rooms is guaranteed by a standard elevator. All rooms are equipped with adequate maneuvering space for wheelchair users. BREAKFAST : sweet and savory buffet. Sweets prepared by hand. LUNCH AND DINNER : 3 choice menus with local products "farm-to-table" and meat and fish dishes every day. Pasta and desserts are homemade. VARIATIONS : the menu is suitable for vegetarians and on request vegan and gluten-free dishes are prepared. In the hotel : outdoor playground area, strollers and, on request, baby sitter and pediatrician service. In the room : free cribs until exhaustion, cots, baby bath. At meals : baby menu on request, baby food and seats at the table (subject to availability). On the beach : children's pool and entertainment service. The hotel has an agreement with numerous bathing establishments in the area (from number 38 to 45). Guests will have at their disposal sunbeds, beach umbrella, showers, beach volleyball and soccer fields, as well as a heated pool of 120 square meters with hydromassage, waterfall and a second heated pool suitable for children. List prices are per person per day for min. 3 days in Full Board and min. 7 days in All Inclusive. Children up to 5 years free if sharing a room with 2 adults. Stay in All Inclusive for € 50 per day per person! Children free up to 12 years if sharing a room with two adults. Full board including drinks at the table and parking, air conditioning and access to the hotel pool € 45.00 per adult per day. Children free up to 12 years.